The BELLEZA TWO PIECE Toilets are developed based on our programme of market development for Gulf country, Middle East and Southeast Asia, market. In order to gain a success of our market development, we sincerely sell this item in a special price and assure the good quality. We also welcome your own design and OEM cooperation. With a strong home base. We are one of the renowned Manufacturers Suppliers and Exporters of Ceramic Squatting Pans that can be easily installed. Manufactured using superior quality of material, our range of Ceramic Squatting Pans is highly durable. We offer Ceramic Squatting Pans in different sizes and shapes in compliance with the requirement of clients. We are a notable Orissa Pan Manufacturer, Exporter and Supplier. We bring forth a huge variety of Orissa Pan in different colors and styles. 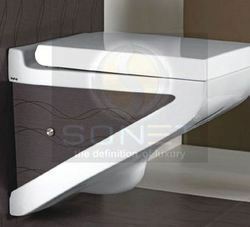 This Orissa Pan, that we make available, is sure to enhance the modernity of any simple looking washroom. 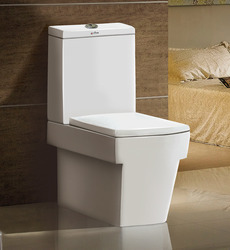 We are reckoned as a reputed Exporter and Supplier of European Water Closet based in Morbi (Gujarat). Having associations with the most reliable vendors, we assure that the European Water Closet is fabricated using the finest quality materials. European Water Closet brings a sophisticated touch to the bathroom. The European Water Closet can be availed from us at the market leading prices. We are importer & Whole Seller of One Pc Toilet. We have wide range in One pc toilet in White & Ivory colors. Good Quality with Best Price. We have one pcs toilet with 100mm, 230mm, 300mm roughing hole. We offer a wide range of commodes, commode stools, raised toilet seats, grab bars and more. These are provided with customized solutions and are made of strong quality raw material. This is the latest WC available in the market, which is available with complete flushing mechanism and seat cover in box packing. There are other models available too.